Hold the container and lid carefully. Twist the lid a quarter turn to the left. The lid will pop up. Fill the container with 4 cups (2 pints) of water. The water will change to a turquoise color when mixed with the bait. Close tightly by placing the lid back on the container and turning it to the right. Gently swirl the trap to mix the formula. Keep trap closed for 48 hours to activate the bait. Once the bait is activated, open the trap by twisting the lid a quarter turn to the left–catch flies for up to 30 days! 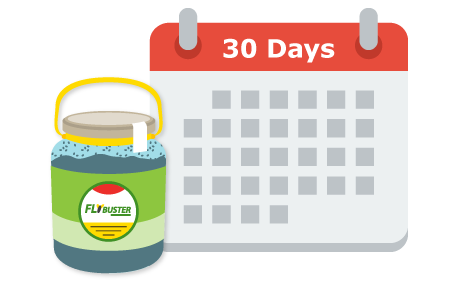 The Flybuster garden trap lasts 30 days or until full. 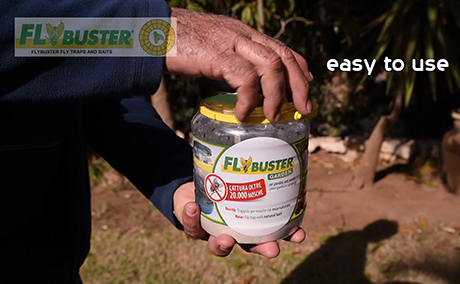 The Flybuster Garden trap should be placed 20 feet away from the target building or area to be protected. Place or hang the trap approximately 5 feet off the ground. For best results in large areas, surround the target area or structure with multiple Flybuster traps. Place the traps around the perimeter 45 feet from each other. Flybuster is now ready for use! You should see results in about 2 days (48 hours). Flies are captured in the container for safe and easy handling.